With lobed leaves and lush, trailing vines, English Ivy is a beautiful accent plant. It blends beautifully in a dish garden, adding texture to a variety of tropical plants. 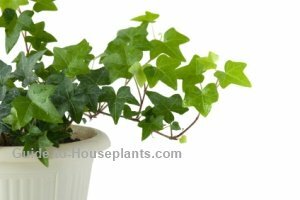 Ivy is a vigorous grower with strong, wiry stems densely covered with distinctive foliage. Although commonly grown as a hanging plant indoors, its aerial roots can easily be trained to climb a moss stick or trellis. There are hundreds of types of ivy varieties -- some with plain green leaves, others are variegated with yellow, gold or creamy white. Many named cultivars are available to choose from. As their names suggest, 'Itsy Bitsy' is a small variety. 'Curlilocks' has wavy leaves. Among those with variegated leaves are 'Gold Child' (one of my favorites) splashed with yellow-gold, white and shades of gray. 'Glacier' ivy has silvery gray-green leaves edged in creamy white. Dry leaves? 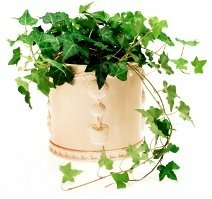 Cool, moist air and evenly moist soil will help your English Ivy thrive indoors. Protect it from drafts and heating vents. Mist the plant often to keep its leaves from drying out. Misting also helps to keep away spider mites that love to attack this plant. Prune it back, if you want to keep your ivy plant to a desired length. Light pruning can be done any time of year. Shed some light. Growing ivy with plenty of bright light will help variegated ivies to keep their color. Prune off any stems of variegated ivy that reverts to all green. CAUTION: English ivy leaves are poisonous if eaten and it can cause skin irritation. It's a good idea to wear gloves while handling this plant. Height: It will climb as high as it is allowed to. Light: Bright light, but no direct sun. Ivy thrives under fluorescent light. If a variegated variety changes to mostly green, it isn't getting enough light. Water: Keep soil evenly moist but not soggy spring through fall; slightly drier in winter. Humidity: Raise the humidity by misting with water or standing the plant on a tray of wet pebbles. Soil: Peat moss based mix, such as African violet potting mix. Fertilizer: Feed monthly from spring through fall with a high-nitrogen liquid fertilizer. Propagation: Take 3-4 in (8-10 cm) stem tip cuttings in spring and root in moist soil or water.